Jean-Marie Leclair was one of the main violinists in France in the second quarter of the 18th century. That was when most of his collections of sonatas were printed. Leclair was educated as a dancer and a violinist, and for some time acted in both capacities. His contact with the Italian violin virtuoso Giovanni Battista Somis, pupil of Arcangelo Corelli, came at a key moment in his career. He decided to concentrate on playing the violin and writing for his own instrument. Leclair composed some music for the theatre - which is lost, except his opera Scylla et Glaucus - but otherwise his oeuvre comprises only music for violin. Between 1723 and 1743 he published four books of sonatas for violin and basso continuo. These show an increasing amount of virtuosity. The later books reflect the development in his skills as a violinist and the influence of his teacher Somis and - more generally - the Italian style. These, and the two sets of violin concertos were probably written for his own use in the first place. Most of them seem too complicated for amateurs. The trio sonatas are different: such pieces were written for non-professional players and printed in large numbers across Europe. 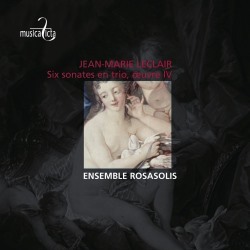 Leclair's trio sonatas op. 4 are less demanding than the solo sonatas. They bear witness to the Italian influence in Leclair's compositional style. With the exception of Sonata No. 3 they are all in four movements and are modelled after the Corellian sonata da chiesa. The titles of the movements are all in Italian. Only some refer to the dance: the fourth movement of Sonata No. 3 is a sarabanda, Sonata No. 5 closes with a giga and Sonata No. 6 has a gavotta as its third movement. There are none of the character pieces that were common in French music of the time. Italian influence also comes to the fore in the harmonic language in some movements. The time these sonatas were published was also the time the galant idiom conquered Europe but its features are largely absent in these sonatas. They are more complicated and include more counterpoint than was usual in galant repertoire. Also notable is the fact that the basso continuo often plays a quite independent role. Although Leclair was clearly influenced by the Italian style his music reflects the ideal of many French composers of the time: the mixture of the Italian and the French idiom, generally called the goûts réunis. Traditionally the French had problems with what they considered extremes in Italian music: it was overly virtuosic and excessively theatrical. In the preface to his op. 4 Leclair expresses his wish to moderate these features. He states that "[an] important point (...) is to avoid that confusion of notes that people add to vocal and expressive pieces, and that serve only to disfigure them." This has to be interpreted as a warning not to add too many ornaments to what he had written down. That was exactly the feature of Italian music that many French music-lovers disliked. Leclair's preface reflects his own style of playing which was described as pleasant and mellow in tone.